. Introducing Flapper Wines, one of the newest custom wine labels in the Noontime Labels gallery! (Note, this design is temporarily unavailable on our website. Please contact us if you’d like to order the Flapper Custom Wine Label. Flapper Wines gives a nod to the Roaring Twenties and the days of Prohibition and speakeasies. This Art Deco inspired label is sophisticated and fun. This is the perfect personalized label to adorn your homemade wines at your next cocktail party or intimate dinner party. This label is 3.3 inches by 4 inches, and is perfect for nearly any wine bottle. The pressure sensitive adhesive allows you to easily peel and stick them on your bottles. And with the removable adhesive, you can take them off easily, as well. It’s simple to create your own wine bottle label. Just change the text in the boxes provided to quickly personalize your wine label. You can also use the Advanced Editor to completely customize your label. Getting custom wine labels for your homemade wine has never been easier! Make the label on your bottle tell the world how wonderful your wines are. Check out the wide variety of custom wine labels available at Noontime Labels, and order yours today. Like the look of this custom wine label? 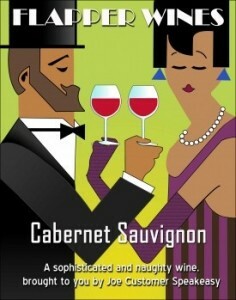 Check out Flapper, a wine label design available in 3 inches by 5 inches. This entry was posted in Custom Labels, Gifts, Homemade Wine and tagged Bottles, Dinners, Gifts, Labels, Parties, Receptions by Noontime. Bookmark the permalink.